Fully leased upscale 9 bedroom with large closets and all new furnace,hot water heater,central air,200 amp electric service,with 2nd floor sub panel,all new kitchens and baths,off street parking for 9+cars.A beautiful income property very close to downtown.Property comes completely furnished. Binghamton High School Pre-School, High School / Public 3 0.12 mi. West Middle School Pre-School, Middle School / Public 3 0.98 mi. Horace Mann School Elementary School / Public 3 0.53 mi. St John The Evangelist School * Pre-School, Elementary School / Private N/A 0.89 mi. Children's Unit-Treatment & Eval * Elementary School, Middle School, High School / Private N/A 0.72 mi. Seton Catholic-Central High School * Middle School, High School / Private N/A 0.42 mi. 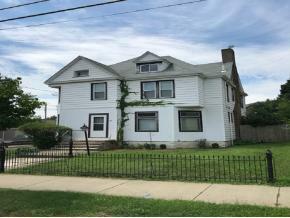 117 Oak St, Binghamton, NY 13905 multi-family home was sold for $300,000.